Iwa’s resources are like no others because they were designed specifically for a group of people for whom very few resources exist--people of Japanese and Asian ancestry. Postmoderns, who share characteristics that are similar to those of Japanese and Asian ancestry, have also found Iwa’s resources useful. 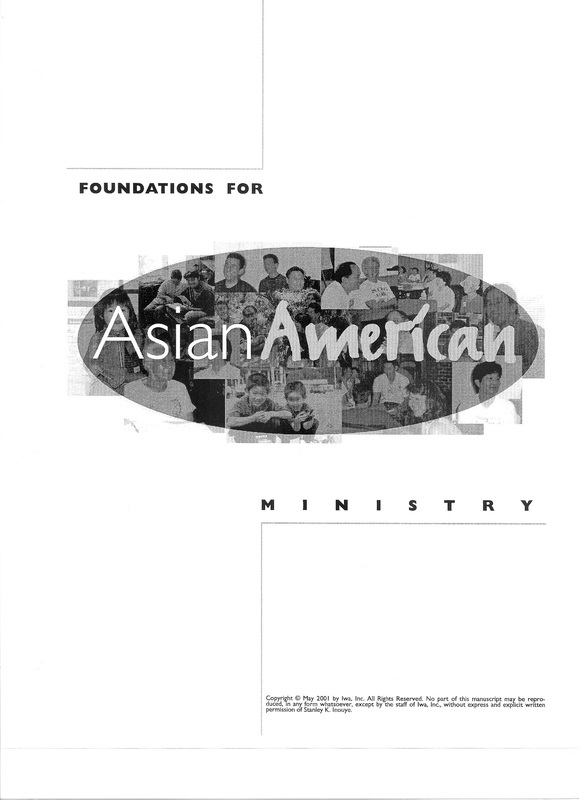 These resources include pamphlets to help a person share the gospel in a culturally sensitive way; booklets, articles, and training materials to help people grow in their relationship with Christ; stories of real-life people and how Christ has become real to them in their daily lives; articles explaining insights on how to reach and minister to people of Japanese and Asian ancestry in effective and culturally sensitive ways; and publications which have recorded Iwa’s discoveries over the years. This fictitious short story, set in feudal Japan, is one of Iwa’s early attempts to present the gospel to people of Japanese ancestry in a non-threatening, imaginative way. This is the first of three articles that came out of an interview with the Iwa staff about the insights on evangelism Iwa would like to share with churches. Here, the staff explains the differences between the closed set approach and the centered set approach to evangelism, and describes how the centered set approach presents a way of seeing and doing evangelism that is completely different from traditional approaches and more consistent with the sensibilities of relational, process-oriented people. This is the second of three articles that came out of an interview with the Iwa staff about the insights on evangelism Iwa would like to share with churches. Here, the staff describes further the relational process that takes place in a centered set approach to evangelism and offers a fresh insight concerning how Jesus’ whole ministry can be considered “evangelism” from the perspective of a centered set approach. In this article, it is asked, "Where is the renewed sense of the church of the New Testament, the whole-hearted worship, the manifestation of the fullness and power of the Spirit, the unity, the spiritual gifts, the evangelism which is a natural outcome of love overflowing" in the Japanese American community? Addressing this question, the article spotlights several cultural and experiential barriers to church renewal and proposes ways to clear the way for renewal to take place. This unconventional handbook was written from the perspective of God the Father who offers suggestions on how to spend a weekly date—Sabbath—with him. Iwa believes that Sabbath is a key to the evangelism that needs to take place in the Asian American community. This booklet is a tool that presents the Bible story in a relational way–as a family story about God as our Heavenly Father; and human beings as children who broke away from His family; and God’s Son, Jesus, as the one came to bring us back into the family, at infinite cost to Himself and to the Father because of their incredible love for us. It is not a ‘tract’ to be passed out indiscriminately. But it is a story to be shared with those who already have had some exposure to Christ through Christians, and who want to find out more about the Bible and seek a clearer understanding of what it means to be a Christian. The story also helps deepen and enrich the faith of Christians who have only been exposed to a traditional Western presentation of the Gospel and not to a non-traditional, relational, group-oriented presentation, such as this story is. Had Your Feet Washed Lately? This article explores the idea that effective evangelism flows out of personal renewal in our relationship with Jesus Christ. For that renewal to happen, unlike the Apostle Peter, we must allow Jesus to wash our feet—cleanse, serve, revitalize, and “reevangelize” us. This study explores a key cultural characteristic of Japanese and other Asian people—“omoiyari” (i.e., empathy)--and provides the rationale for developing a new approach to reaching Asian Americans with the gospel that differs from traditional approaches. May I Introduce Someone to You Who Changed My Life. . . . This booklet is the result of an attempt by Iwa Executive Director, Cyril Nishimoto, to create a new and different kind of sharing tool—one that introduces people to a living and very real person, Jesus Christ, rather than to the Plan of Salvation, through stories. There are seven stories from the Bible about the encounters of real-life people with Jesus, and seven stories about Cyril’s own present-day encounters with that same Jesus depicted in each of the Bible stories. Designed also to encourage Christians to write their own stories and use them as sharing tools for introducing people to Jesus, the booklet ends with an invitation to the reader to begin an intimate relationship with Jesus, or in the alternative, to get to know Him better. Miracles in Little Tokyo: Seeking the Prosperity of the City is the story of Bill Watanabe, Executive Director of Little Tokyo Service Center (LTSC) and how God led him and LTSC to create services and programs that have revitalized Little Tokyo. Union Center for the Arts, Casa Heiwa, the Tofu Festival, Asian Americans for Miracle Marrow Matches, the Little Tokyo Recreation Center—Bill has amazing stories of God being involved in these and other projects that have breathed new life into Little Tokyo. Read some samples of Bill's stories here on the left. Three study guides have been created to make Miracles in Little Tokyo usable by churches. Instead of Bible study, the study of Bill’s story can be “life study.” And it can be used as an evangelistic study to introduce seekers to God as Someone who is alive and real, and active in the lives of people and on behalf of whole communities in concrete ways. If God created human beings to be a reflection of God’s image, how can the Church, representing a fallen humanity restored by Jesus Christ, fully reflect the divine image of God? This article reprinted from Christianity Today (Volume 33, No.4) describes how the Church, through Jesus Christ, can repair the mirror of God—humankind’s original one world culture—which was shattered at the Tower of Babel, by honoring and embracing each broken fragment—each racial and ethnic piece. Back in the early ‘80s, Iwa was talking about the elder brother in Jesus’ story of The Prodigal Son as being a key figure for Japanese- and Asian Americans to focus on when everyone else was making the younger brother the center of attention. This signature piece of Iwa shows the elder brother’s rejection of his father’s love and failure to be motivated by love in return, to be a depiction of the unrecognized sin that people of Japanese ancestry and others from shame-based cultures seem to have toward God. This is the story of former Iwa staff member, Danny Matsuda. Danny shares how a devastating divorce brought him into a relationship with Christ who gave him hope, healing, and a future. This article appeared in the Christian magazine, Radix (Vol. 21 No. 4), in 1993. It delivers the content of Iwa’s study, “Hearing the Gospel With Asian American Ears,” in a conversational form. Exploring a key cultural characteristic of Japanese and other Asian people—“omoiyari” (i.e., empathy)—it provides the rationale for developing a new approach to reaching Asian Americans with the gospel that differs from traditional approaches. This article explores the Japanese concept of shame as a key to understanding how a meaningful presentation of the gospel to people of Japanese ancestry can be made. Jesus’ sacrifice of his life for us on the cross to purge us of sin and heal our broken relationship with God, is compared to a samurai’s self-sacrificing act of seppuku (ritual suicide or hara-kiri) to erase dishonor and restore harmony to a family or group where shame has disgraced and destroyed. If passing out tracts, sharing the Plan of Salvation with strangers, doing door-to-door witnessing, and practicing other traditional methods of spreading the gospel make evangelism seem at odds with a Japanese or Asian cultural upbringing, perhaps different, more culturally consistent methods need to be found to make evangelism seem more doable. This article offers one--“withness”—a relational practice that Jesus himself used that may fit the culture of people of Japanese or Asian ancestry. Please let us know what you think about any of our resources.